Artificial turf is a surface of synthetic fibers made to look like natural grass. It is most often used in arenas for sports that were originally or are normally played on grass. However, it is now being used on residential lawns and commercial applications as well. The main reason is maintenance—artificial turf stands up to heavy use, such as in sports, and requires no irrigation or trimming. Domed, covered, and partially covered stadiums may require artificial turf because of the difficulty of getting grass enough sunlight to stay healthy. Artificial turf does have its downside, however: limited life, periodic cleaning requirements, petroleum use, toxic chemicals from infill, and heightened health and safety concerns. Artificial turf first gained substantial attention 53 years ago in 1966, when it was installed in the year-old Astrodome. The specific product used was "ChemGrass", developed by Monsanto and rebranded as AstroTurf; this term since then became a generic trademark for any artificial turf throughout the late 20th century. AstroTurf remains a registered trademark but is no longer owned by Monsanto. The first generation turf systems (i.e., short-pile fibers without infill) of the 1960s have been largely replaced by the second generation and third generation turf systems. Second generation synthetic turf systems feature longer fibers and sand infills, and third generation systems, which are most widely used today, offer infills that are mixtures of sand and granules of recycled rubber aka "rubber crumb". David Chany, who moved to Raleigh, North Carolina, in 1960 and later served as Dean of the North Carolina State University College of Textiles, headed the team of Research Triangle Park researchers who created the first notable artificial turf. That accomplishment led Sports Illustrated to declare Chaney as the man "responsible for indoor major league baseball and millions of welcome mats." Artificial turf was first installed in 1964 on a recreation area at the Moses Brown School in Providence, Rhode Island. The material came to public prominence in 1966, when AstroTurf was installed in the Astrodome in Houston, Texas. The state-of-the-art indoor stadium had attempted to use natural grass during its initial season in 1965, but this failed miserably and the field conditions were grossly inadequate during the second half of the season, with the dead grass painted green. Due to a limited supply of the new artificial grass, only the infield was installed before the Houston Astros' home opener in April 1966; the outfield was installed in early summer during an extended Astros road trip and first used after the All-Star Break in July. The use of AstroTurf and similar surfaces became widespread in the U.S. and Canada in the early 1970s, installed in both indoor and outdoor stadiums used for baseball and football. More than 11,000 artificial turf playing fields have been installed nationally. More than 1,200 were installed in the U.S. in 2013 alone, according to the industry group the Synthetic Turf Council. Maintaining a grass playing surface indoors, while technically possible, is prohibitively expensive. Teams who chose to play on artificial surfaces outdoors did so because of the reduced maintenance cost, especially in colder climates with urban multi-purpose "cookie cutter" stadiums such as Cincinnati's Riverfront Stadium, Pittsburgh's Three Rivers Stadium and Philadelphia's Veterans Stadium. Tropicana Field is installed with an artificial turf field. Artificial turf was first used in Major League Baseball in the Houston Astrodome in 1966, replacing the grass field used when the stadium opened a year earlier. Even though the grass was specifically bred for indoor use, the dome's semi-transparent Lucite ceiling panels, which had been painted white to cut down on glare that bothered the players, did not pass enough sunlight to support the grass. For most of the 1965 season, the Astros played on green-painted dirt and dead grass. The solution was to install a new type of artificial grass on the field, ChemGrass, which became known as AstroTurf. Because the supply of AstroTurf was still low, only a limited amount was available for the first home game. There was not enough for the entire outfield, but there was enough to cover the traditional grass portion of the infield. The outfield remained painted dirt until after the All-Star Break. The team was sent on an extended road trip before the break, and on July 19, 1966, the installation of the outfield portion of AstroTurf was completed. The Chicago White Sox became the first team to install artificial turf in an outdoor stadium, as they used it in the infield and adjacent foul territory at Comiskey Park from 1969 through 1975. Artificial turf was later installed in other new multi-purpose stadiums such as Pittsburgh's Three Rivers Stadium, Philadelphia's Veterans Stadium, and Cincinnati's Riverfront Stadium. Early AstroTurf baseball fields used the traditional all-dirt path, but in the early 1970s, teams began using the "base cutout" layout on the diamond, with the only dirt being on the pitcher's mound, batter's circle, and in a "sliding box" around each base. With this layout, a painted arc would indicate where the edge of the outfield grass would normally be, to assist fielders in positioning themselves properly. The last stadium in MLB to use this configuration was Rogers Centre in Toronto, when they switched to an all-dirt infield (but keeping the artificial turf) after the 2015 season. The Arizona Diamondbacks plan to convert Chase Field to artificial turf for the 2019 season. The stadium has had grass since its opening in 1998, but the difficulty of maintaining of grass in the stadium, which has a retractable roof and is located in a desert city, has been cited as the reason for the switch. The biggest difference in play on artificial turf was that the ball bounced higher than on real grass and also traveled faster, causing infielders to play farther back than they would normally so that they would have sufficient time to react. The ball also had a truer bounce than on grass so that on long throws fielders could deliberately bounce the ball in front of the player they were throwing to, with the certainty that it would travel in a straight line and not be deflected to the right or left. However, the biggest impact on the game of "turf", as it came to be called, was on the bodies of the players. The artificial surface, which was generally placed over a concrete base, had much less give to it than a traditional dirt and grass field did, which caused more wear-and-tear on knees, ankles, feet, and the lower back, possibly even shortening the careers of those players who played a significant portion of their games on artificial surfaces. Players also complained that the turf was much hotter than grass, sometimes causing the metal spikes to burn their feet or plastic ones to melt. These factors eventually provoked a number of stadiums, such as the Kansas City Royals' Kauffman Stadium, to switch from artificial turf back to natural grass. In 2000, Tropicana Field became the first MLB field to use a third-generation artificial surface, FieldTurf. All other remaining artificial turf stadiums were either converted to third-generation surfaces or were replaced entirely by new natural grass stadiums. In a span of 13 years, between 1992 and 2005, the National League went from having half of its teams using artificial turf to all of them playing on natural grass. With the replacement of Minneapolis's Hubert H. Humphrey Metrodome by Target Field in 2010, only two MLB stadiums used artificial turf from 2010 through 2018: Tropicana Field and Toronto's Rogers Centre. In 2019, this number will grow to three when Arizona's Chase Field replaces its natural grass surface with artificial turf, and in 2020, the new Globe Life Field in Arlington, Texas will also have an artificial surface. The first professional American football team to play on artificial turf was the Houston Oilers, then part of the American Football League, who moved into the Astrodome in 1968, which had installed AstroTurf two years prior. In 1969, the University of Pennsylvania's Franklin Field in Philadelphia, at the time also home field of the Philadelphia Eagles, switched from grass to AstroTurf, making it the first National Football League stadium to use artificial turf. In 2002, CenturyLink Field, originally planned to have a natural grass field, was instead surfaced with FieldTurf upon positive reaction from the Seattle Seahawks when they played on the surface at their temporary home of Husky Stadium during the 2000 and 2001 seasons. This would be the first of a leaguewide trend taking place over the next several seasons that would not only result in teams already using artificial surfaces for their fields switching to the new FieldTurf or other similar surfaces but would also see several teams playing on grass adopt a new surface. (The Indianapolis Colts' RCA Dome and the St. Louis Rams' Edward Jones Dome were the last two stadiums in the NFL to replace their first-generation AstroTurf surfaces for next-generation ones after the 2004 season). For example, after a three-year experiment with a natural surface, Giants Stadium went to FieldTurf for 2003, while M&T Bank Stadium added its own artificial surface the same year (it has since been removed and replaced with a natural surface, which the stadium had before installing the turf). Later examples include Paul Brown Stadium, which went from grass to turf in 2004; Gillette Stadium, which made the switch in 2006; and NRG Stadium, which did so in 2015. Today, 12 NFL fields out of 31 are artificial. The first professional Canadian football stadium to use artificial turf was Empire Stadium in Vancouver, British Columbia, then home of the CFL's BC Lions, which installed 3M TartanTurf in 1970. Today, eight of the nine stadiums in the Canadian Football League currently use artificial turf. The only one that does not is BMO Field in Toronto, which initially had an artificial pitch and has been shared by the CFL's Toronto Argonauts since 2016 (however, part of the endzones at that stadium are covered with artificial turf). The first stadium to use the next-generation surface was Ottawa's Frank Clair Stadium (now TD Place Stadium), which the Ottawa Renegades used when they began play in 2002. The last stadium to replace their first-generation artificial surface for a newer one was the Saskatchewan Roughriders' Taylor Field, which replaced it in 2007. NFL players overwhelmingly prefer natural grass over synthetic surfaces, according to a league survey conducted in 2010. When asked, "Which surface do you think is more likely to shorten your career? ", 90% responded artificial turf. The introduction of synthetic surfaces has significantly changed the sport of field hockey. Since being introduced in the 1970s, competitions in western countries are now mostly played on artificial surfaces. This has increased the speed of the game considerably and changed the shape of hockey sticks to allow for different techniques, such as reverse stick trapping and hitting. Field hockey artificial turf differs from artificial turf for other sports, in that it does not try to reproduce a grass "feel", being made of shorter fibers. This shorter fiber structure allows the improvement in speed brought by earlier artificial turfs to be retained. This development in the game, however, is problematic for many local communities who often cannot afford to build two artificial fields: one for field hockey and one for other sports. The International Hockey Federation and manufacturers are driving research in order to produce new fields that will be suitable for a variety of sports. The use of artificial turf in conjunction with changes in the game's rules (e.g., the removal of offside, introduction of rolling substitutes and the self-pass, and to the interpretation of obstruction) have contributed significantly to change the nature of the game, greatly increasing the speed and intensity of play as well as placing far greater demands on the conditioning of the players. Some association football clubs in Europe installed synthetic surfaces in the 1980s, which were called "plastic pitches" (often derisively) in countries such as England. There, several professional club venues had adopted them; QPR's Loftus Road, Luton Town's Kenilworth Road, Oldham Athletic's Boundary Park and Preston's Deepdale. QPR had been the first team to install an artificial pitch at their stadium in 1981, but were the first to remove it when they did so in 1988. The last Football League team to have an artificial pitch in England was Preston North End, who removed their pitch in 1994 after eight years in use. Turf gained a bad reputation on both sides of the Atlantic with fans and especially with players. The first AstroTurfs were a far harder surface than grass and soon became known as an unforgiving playing surface that was prone to cause more injuries, and in particular, more serious joint injuries, than would comparatively be suffered on a grass surface. This turf was also regarded as aesthetically unappealing to many fans. In 1981, London football club Queens Park Rangers dug up its grass pitch and installed an artificial one. Others followed, and by the mid-1980s there were four artificial surfaces in operation in the English league. They soon became a national joke: the ball pinged round like it was made of rubber, the players kept losing their footing, and anyone who fell over risked carpet burns. Unsurprisingly, fans complained that the football was awful to watch and, one by one, the clubs returned to natural grass. In the 1990s, many North American soccer clubs also removed their artificial surfaces and re-installed grass, while others moved to new stadiums with state-of-the-art grass surfaces that were designed to withstand cold temperatures where the climate demanded it. The use of artificial turf was later banned by FIFA, UEFA and by many domestic football associations, though, in recent years, both governing bodies have expressed resurrected interest in the use of artificial surfaces in competition, provided that they are FIFA Recommended. UEFA has now been heavily involved in programs to test artificial turf, with tests made in several grounds meeting with FIFA approval. A team of UEFA, FIFA and German company Polytan conducted tests in the Stadion Salzburg Wals-Siezenheim in Salzburg, Austria which had matches played on it in UEFA Euro 2008. 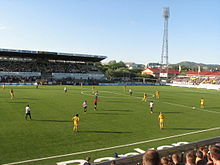 It is the second FIFA 2 Star approved artificial turf in a European domestic top flight, after Dutch club Heracles Almelo received the FIFA certificate in August 2005. The tests were approved. FIFA originally launched its FIFA Quality Concept in February 2001. UEFA announced that starting from the 2005–06 season, approved artificial surfaces were to be permitted in their competitions. A full international fixture for the 2008 European Championships was played on 17 October 2007 between England and Russia on an artificial surface, which was installed to counteract adverse weather conditions, at the Luzhniki Stadium in Moscow. It was one of the first full international games to be played on such a surface approved by both FIFA and UEFA. However, UEFA ordered that the 2008 European Champions League final hosted in the same stadium in May 2008 must take place on grass, so a temporary natural grass field was installed just for the final. UEFA stressed that artificial turf should only be considered an option where climatic conditions necessitate. One Desso "hybrid grass" product incorporates both natural grass and artificial elements. In June 2009, following a match played at Estadio Ricardo Saprissa in Costa Rica, American national team manager Bob Bradley called on FIFA to "have some courage" and ban artificial surfaces. FIFA designated a star system for artificial turf fields that have undergone a series of tests that examine quality and performance based on a two star system. Recommended two-star fields may be used for FIFA Final Round Competitions as well as for UEFA Europa League and Champions League matches. There are currently 130 FIFA Recommended 2-Star installations in the world. In 2009, FIFA launched the Preferred Producer Initiative to improve the quality of artificial football turf at each stage of the life cycle (manufacturing, installation and maintenance). Currently, there are five manufacturers that were selected by FIFA: Act Global, Limonta, Desso, GreenFields, and Edel Grass. These firms have made quality guarantees directly to FIFA and have agreed to increased research and development. In 2010, Estadio Omnilife with an artificial turf opened in Guadalajara to be the new home of Chivas, one of the most popular teams in Mexico. The owner of Chivas, Jorge Vergara, defended the reasoning behind using artificial turf because the stadium was designed to be "environment friendly and as such, having grass would result [in] using too much water." However, players harshly criticized the field, saying it caused many injuries as a result of the harder surface. When Johan Cruyff became the adviser of the team, he recommended the switch to natural grass, which the team did in 2012. In November 2011, it was reported that a number of English football clubs were interested in using artificial pitches again on economic grounds. As of October 2016, artificial pitches are not permitted in the Premier League or Football League but are permitted in the National League and lower divisions. The two most prominent English football clubs to currently use third-generation artificial pitches are Sutton United, whose FIFA 2-Star quality pitch was installed at Gander Green Lane in August 2015, and Maidstone United, whose 2-Star pitch was built along with the new Gallagher Stadium in July 2012. Matches between the two clubs have been named by fans El Plastico (a reference to El Clásico). Artificial pitches are also permitted in all rounds of The FA Cup competition. The Women's World Cup took place entirely on artificial surfaces, as the event was played in Canada, where almost all of the country's stadiums use artificial turf due to climate issues. This plan garnered criticism from players and fans, some believing the artificial surfaces make players more susceptible to injuries. Over fifty of the female athletes protested against the use of artificial turf on the basis of gender discrimination. However Australia winger Caitlin Foord said that after playing 90 minutes there was no difference to her post-match recovery – a view shared by the rest of the squad. The squad spent much time preparing on the surface and had no problems with its use in Winnipeg. "We've been training on [artificial] turf pretty much all year so I think we're kind of used to it in that way ... I think grass or turf you can still pull up sore after a game so it's definitely about getting the recovery in and getting it right", Foord said. The 2012 Women's World Player of the Year, Abby Wambach, noted "The men would strike, playing on artificial turf." The controversial issue of gender equality and an equal playing field for all has sparked debate in many countries around the world. A lawsuit was filed on 1 October 2014 in an Ontario tribunal court by a group of women's international soccer players against FIFA and the Canadian Soccer Association and specifically points out that in 1994 FIFA spent $2 million to plant natural grass over artificial turf in New Jersey and Detroit. Various celebrities showed their support for the women soccer players in defence of their lawsuit, including actor Tom Hanks, NBA player Kobe Bryant and U.S. men's soccer team keeper Tim Howard. Even with the possibility of boycotts, FIFA's head of women's competitions, Tatjana Haenni, made it clear that "we play on artificial turf and there's no Plan B." Rugby also uses artificial surfaces at a professional level. Infill fields are used by English Aviva Premiership teams Saracens F.C., Newcastle Falcons and Worcester Warriors, as well as Pro14 teams Cardiff Blues and Glasgow Warriors. Some fields, including Twickenham Stadium, have incorporated a hybrid field, with grass and synthetic fibers used on the surface. This allows for the field to be much more hard wearing, making it less susceptible to weather conditions and frequent use. Carpet has been used as a surface for indoor tennis courts for decades, though the first carpets used were more similar to home carpets than a synthetic grass. After the introduction of AstroTurf, it came to be used for tennis courts, both indoor and outdoor, though only a small minority of courts use the surface. Both infill and non-infill versions are used, and are typically considered medium-fast to fast surfaces under the International Tennis Federation's classification scheme. A distinct form found in tennis is an "artificial clay" surface, which seeks to simulate a clay court by using a very short pile carpet with an infill of the same loose aggregate used for clay courts that rises above the carpet fibers. Tennis courts such as Wimbledon are considering using an artificial hybrid grass to replace their natural lawn courts. Such systems incorporate synthetic fibres into natural grass to create a more durable surface on which to play. Such hybrid surfaces are currently used for some association football stadiums, including Wembley Stadium. Synthetic turf can also be used in the golf industry, such as on golf ranges, putting greens and even in some circumstances tee boxes. Because of the vast areas of golf courses and the damage from clubs during shots, it is not feasible to surface fairways with artificial turf. A home's yard with artificial grass. Since the early 1990s, the use of synthetic grass in the more arid western states of the United States has moved beyond athletic fields to residential and commercial landscaping. Artificial turf has been used at airports. Some artificial turf systems allow for the integration of fiber-optic fibers into the turf. This would allow for runway lighting to be embedded in artificial landing surfaces for aircraft (or lighting or advertisements to be directly embedded in a playing surface). Both the rubber granules (often made from recycled waste tires) and the synthetic fibres of artificial turf are subject to wear and can be washed into the environment. Second only to tire and road wear particles (TRWP) that make up a large portion of the fine road debris, the rubber granulate from artificial turf infill constitutes a significant source of rubber pollution. Fragments from the artificial reeds make their way into the environment as microplastics pollution in both marine as well as soil environments. A number of health and safety concerns have been raised about artificial turf. Friction between skin and older generations of artificial turf can cause abrasions and/or burns to a much greater extent than natural grass. Artificial turf tends to retain heat from the sun and can be much hotter than natural grass with prolonged exposure to the sun. There is some evidence that periodic disinfection of artificial turf is required as pathogens are not broken down by natural processes in the same manner as natural grass. Despite this, a 2006 study suggests certain microbial life is less active in artificial turf. There is evidence showing higher rates of player injury on artificial turf. In a study performed by the National Football League Injury and Safety Panel, published in the October 2012 issue of the American Journal of Sports Medicine, Elliott B. Hershman et al. reviewed injury data from NFL games played between 2000 and 2009. "...the injury rate of knee sprains as a whole was 22% higher on FieldTurf than on natural grass. While MCL sprains did not occur at a rate significantly higher than on grass, rates of ACL sprains were 67% higher on FieldTurf." Metatarsophalangeal joint sprain, known as "turf toe" when the big toe is involved, is named from the injury being associated with playing sports on rigid surfaces such as artificial turf and is a fairly common injury among professional American football players. Artificial turf is a harder surface than grass and does not have much "give" when forces are placed on it. Some artificial turf uses infill such as silicon sand and/or granulated rubber, referred to as "crumb rubber". Some granulated rubber is made from recycled car tires and may carry heavy metals which can leach into the water table. As early as 2007, a moratorium on the use of ground-up rubber tires in fields and playgrounds was recommended based on health concerns. As of 2013, the EPA called for further studies to monitor the impact of particulate matter from fields and playgrounds that use artificial turf. ^ a b Dave Brady, "It's All So Artificial: The Uncommon Ground", Petersen's 12th Pro Football Annual, 1972. Los Angeles: Petersen Publishing Co., 1972; pp. 62-65. ^ a b c d Weeks, Jennifer (2015). "Turf Wars". Distillations Magazine. 1 (3): 34–37. Archived from the original on 21 March 2018. Retrieved 22 March 2018. ^ "Chicago Tribune - Historical Newspapers". Archives.chicagotribune.com. Archived from the original on 5 November 2016. Retrieved 1 August 2018. ^ "Blue Jays adding dirt infield at Rogers Centre". MLB.com. Archived from the original on 7 November 2017. Retrieved 1 August 2018. ^ "Arizona Diamondbacks installing synthetic grass at Chase Field". azcentral.com. 12 October 2018. Retrieved 13 October 2018. ^ "Pats sign Testaverde; Gillette Stadium's grass field replaced with Field Turf". 14 November 2006. Archived from the original on 19 April 2012. Retrieved 1 August 2018. ^ "BMO Field: New renovations accommodate TFC, Argos - CBC Sports". Cbc.ca. Archived from the original on 31 January 2017. Retrieved 1 August 2018. ^ Lawton, Graham (4 June 2005). "Field battle over artificial grass". New Scientist (2502): 35. Archived from the original on 17 February 2006. Retrieved 11 January 2008. ^ "England to play on synthetic turf". BBC News. 11 July 2007. Archived from the original on 8 October 2007. Retrieved 11 January 2008. ^ "Field 'No Excuse' For England". Sporting Life UK. Archived from the original on 5 June 2011. Retrieved 11 January 2008. ^ Martyn Ziegler (10 October 2007). "England could slip up on plastic field, warns Ferguson". The Independent. London. Archived from the original on 12 January 2008. Retrieved 11 January 2008. ^ "Desso GrassMaster hybrid grass > reinforced natural grass | Desso Sports Systems". Dessosports.com. Archived from the original on 10 December 2015. Retrieved 24 December 2015. ^ "FIFA Quality Concept – Handbook of Test Methods for Football Turf" (PDF). FIFA. Archived (PDF) from the original on 3 April 2018. Retrieved 20 July 2017. ^ "Football Turf". Fifa.com. Archived from the original on 28 February 2008. ^ "Football Fields". Fifa.com. Archived from the original on 28 February 2008. ^ "Chivas quitará el pasto sintético que costó 1 mdd - construccion". Obrasweb.mx. Archived from the original on 1 August 2018. Retrieved 1 August 2018. ^ "El Estadio Omnilife, listo con pasto natural". Mediotiempo.com. Archived from the original on 8 July 2018. Retrieved 1 August 2018. ^ "Clubs want artificial turf return". BBC News. 18 November 2011. ^ "Artificial 3G Pitches: Coming to a ground near you?". Football Ground Guide. Archived from the original on 31 October 2016. Retrieved 30 October 2016. ^ "The Giraffe, the Pelly & Emily". Gandermonium. Archived from the original on 30 October 2016. Retrieved 30 October 2016. ^ Fox Sports. "USWNT stars not backing down on artificial playing surface stance". FOX Sports. Archived from the original on 20 October 2014. Retrieved 9 October 2014. ^ "elite female players sue". espnW. Archived from the original on 3 October 2014. Retrieved 9 October 2014. ^ Dominic Bossi (10 June 2015). "Matildas stay out of turf war at women's World Cup". Smh.com.au. Archived from the original on 9 January 2016. Retrieved 24 December 2015. ^ "FIFA: The World Cup Should Be Played on Natural Grass". Coworker.org. Archived from the original on 16 October 2014. Retrieved 9 October 2014. ^ "Equalizer Soccer – Players officially file lawsuit against FIFA, CSA over artificial turf at 2015 Women's World Cup". Womens.soccerly.com. Archived from the original on 5 October 2014. Retrieved 9 October 2014. ^ "Players file lawsuit in Canada over artificial Women's World Cup turf". Global News. 1 October 2014. Archived from the original on 8 October 2014. Retrieved 9 October 2014. ^ "FIFA officials to inspect BC Place turf in light of controversy". Global News. 7 October 2014. Archived from the original on 8 October 2014. Retrieved 9 October 2014. ^ a b c d "ITF surface descriptions". Itftennis.com. Archived from the original on 13 June 2018. Retrieved 1 August 2018. ^ "Tennis". Dow.com. 3 August 2001. Archived from the original on 15 December 2015. Retrieved 24 December 2015. ^ "Wimbledon considering controversial plans to introduce artificial grass courts". Tennis365. Archived from the original on 31 July 2018. Retrieved 31 July 2018. ^ Hall, Janet (11 March 2018). "Pros and Cons: Artificial Grass Versus a Live Lawn". Archived from the original on 1 May 2018. Retrieved 30 April 2018. ^ "Airside Applications for Artificial Turf" (PDF). Federal Aviation Administration. 2006. Archived (PDF) from the original on 14 April 2012. Retrieved 9 November 2011. ^ Monte Burke (27 November 2006). "Field of Screens". Forbes. Archived from the original on 15 December 2007. Retrieved 11 January 2008. ^ Kole, Pieter Jan; Löhr, Ansje J.; Van Belleghem, Frank; Ragas, Ad; Kole, Pieter Jan; Löhr, Ansje J.; Van Belleghem, Frank G. A. J.; Ragas, Ad M. J. (20 October 2017). "Wear and Tear of Tyres: A Stealthy Source of Microplastics in the Environment". International Journal of Environmental Research and Public Health. 14 (10): 1265. doi:10.3390/ijerph14101265. Archived from the original on 29 August 2018. Retrieved 29 August 2018. ^ "Tire wear foremost source of microplastics". IVL Swedish Environmental Research Institute. 29 March 2016. Archived from the original on 19 April 2017. Retrieved 19 April 2017. researchers have ranked the sources of microplastic particles by size. The amount of microplastic particles emitted by traffic is estimated to 13 500 tonnes per year. Artificial turf ranks as the second largest source of emissions and is responsible for approximately 2300-3900 tonnes per year. ^ "Microplastic Pollution from Artificial Grass – A Field Guide". KIMO. 27 February 2017. Archived from the original on 19 April 2017. Retrieved 19 April 2017. ^ "Artificial Turf. Why it is not the answer". SELVA. Archived from the original on 3 August 2016. Retrieved 19 April 2017. ^ "Microplastics in agricultural soils: A reason to worry?". Norwegian Institute for Water Research (NIVA). 3 February 2017. Archived from the original on 19 April 2017. Retrieved 19 April 2017. Microplastics are increasingly seen as an environmental problem of global proportions. While the focus to date has been on microplastics in the ocean and their effects on marine life, microplastics in soils have largely been overlooked. Researchers are concerned about the lack of knowledge regarding potential consequences of microplastics in agricultural landscapes from application of sewage sludge. ^ a b "New Penn State Study Debunks Staph Bacteria Scare In Synthetic Turf" (Press release). Penn State College of Agricultural Sciences. 30 August 2006. Archived from the original on 30 August 2006. Retrieved 11 January 2008. ^ C. Frank Williams, Gilbert E. Pulley (2002). "Synthetic Surface Heat Studies" (PDF). Brigham Young University. Archived (PDF) from the original on 10 April 2008. Retrieved 19 February 2008. ^ "Ask Dr. Geier – Are ACL tears more common on grass or FieldTurf? | Dr. David Geier – Sports Medicine Simplified". Dr. David Geier. 18 January 2013. Archived from the original on 9 January 2016. Retrieved 24 December 2015. ^ "Turf Toe-OrthoInfo – AAOS". Orthoinfo.aaos.org. 1 August 2012. Archived from the original on 9 December 2015. Retrieved 24 December 2015. ^ David R. Brown, Sc.D. (2007). "Artificial Turf" (PDF). Environment & Human Health, Inc. Archived (PDF) from the original on 10 April 2008. Retrieved 21 December 2007.